This winter has proven to be the harshest one yet – leaving me with dry skin, chapped lips and a fervent desire to moisturize, moisturize, moisturize. While I gave a lot of thought to the balms, lotions, serums and oils I slathered on my face and body, I never stopped to consider that switching body washes might also help. Luckily, the new Dove Deep Moisture Nourishing Body Wash landed in my all-too-dry hands just in time to help my skin transition through a severe winter to the first chilly, dreary days of spring. Infused with a unique Nutrium Moisture complex, this body wash nourishes skin with a rich, moisturizing lather. I love the scent (a fragrant version of the classic “clean soap” smell) and how the suds rinse away cleanly with no residue. Over the past few days, I’ve stopped moisturizing post-shower just to see whether this body wash holds up on its own. My elbows, knees and feet—all problem areas—are a bit rough, but my arms and legs feel as though I’ve never missed a lotion application (which is pretty impressive). Dove Deep Moisture Nourishing Body Wash is a drugstore delight for the transitional season and beyond (think bare summer skin). Now, if only this dreary weather would get a move on so I can look forward to sunshine, skirts and sandals. Introducing a new, breakthrough body wash from Dove. 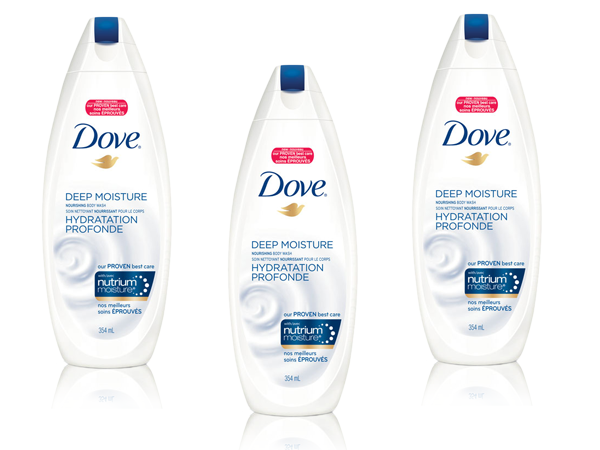 New, improved Dove® Deep Moisture combines a blend of our mildest cleansers ever and NutriumMoisture®, our rich blend of nutrients naturally found in your skin which effectively nourishes deep down. This is our PROVEN best care. Head to our Facebook (facebook.com/dove) page today for a $2-off coupon & tell us why you want to make the switch? Disclosure: This post was brought to you by Dove via Glam Media Canada. The opinions expressed herein are those of the author and are not indicative of the opinions or positions of Dove.